1) Prepare 1 liter of distilled / mineral water in a container. Boil half liter first, when water starts to boil, add in 6 table spoon of sugar (or 80gm cane sugar etc.). Add the other half liter as it boils. Don't boil it for long, the purpose for boiling is to sterilise the sugar. 2) Add in 3 sachet of Tea (black Tea, Boh Tea or any other tea.) Turn off heat, leave the Tea bags in the boiled water for a 3 - 5 minutes. Strain the Tea into a container and leave it cool down to room temperature. 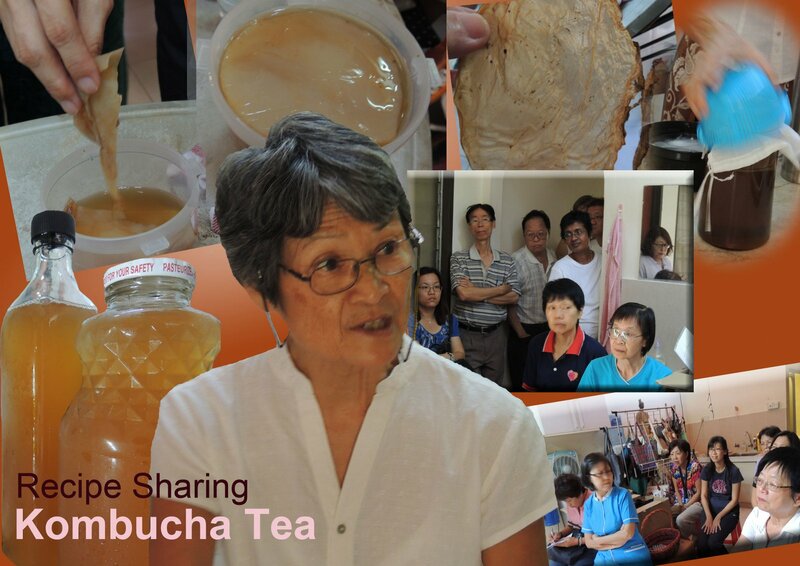 4) Add in the starter (culture)+ scoby to the cooled Tea. Cover with a cloth and keep in cool, place for 1 week or 10 days for those having diabetes. Add additional cover i.e strainer to keep away the fruit flies & avoid contamination. After a week to 10 days, strain the Kombucha Tea in bottles and keep them in fridge. Cool Kombucha Tea is great to drink. And can drink 2 teaspoon initially (neat) or mix with water.